In the summer of 2015, I was lucky enough to spend nine weeks working on an independent and research-focussed internship under the auspices of the Laidlaw Undergraduate Internship Programme in Research and Leadership. 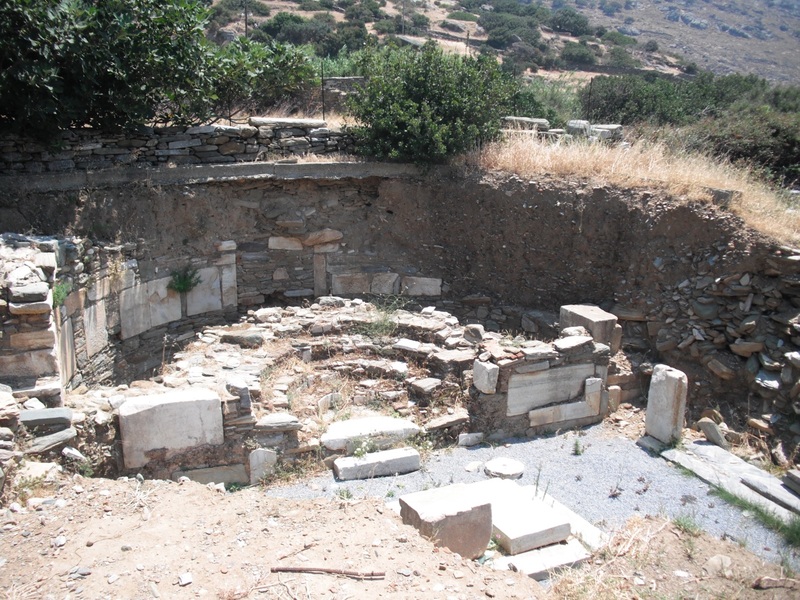 With the supervision of Dr Rebecca Sweetman, I devised a methodology and itinerary to investigate the Christianisation of the Cyclades, looking particularly at late antique churches which were built on virgin land (as opposed to those built on previous temple space). In order to carry out this project I travelled to Greece for five weeks, three of which I spent travelling around the Cycladic islands with Nefeli Piree Iliou, a recent St Andrews graduate. The first stage of my research project was a serious amount of desk-based reading. While most other people were celebrating the end of exams and the start of summer, I was (very happily!) in the library here in St Andrews. I began by looking for any mention of late antique churches on the six islands in question (Delos, Sikinos, Folegandros, Andros, Tinos and Kea) before spending many an hour scrolling through Google Earth imagery trying to pinpoint any visible remains to give me a solid list of locations to visit. This stage taught me a lot about what it means to do research: it can be long, lonely, frustrating work at times. But if it was too easy, it wouldn’t be original research! My internship officially began at the start of July, when I was fortunate enough to spend a week staying and researching at the British School at Athens (BSA). I carried on my desk-based research, but this time with a vastly more specialised library at my disposal. I was able to read excavation reports, archived publications, and journal issues – many of which are unavailable online or anywhere else in the world. My time at the BSA was enlightening for my project and for myself. I realised quite quickly that I was at a disadvantage being unable to read modern Greek, though I managed to brush up on my A-Level French enough to make use of the archive of French material. I also experienced the personal dimension of modern academia, meeting some really fascinating people from all over the world who had come to Athens to work on their particular projects. From the BSA I travelled to the Cycladic islands, where I spent three weeks with my fieldwork partner Nefeli. Together, we visited a total of forty-six sites identified in the desk-based stage of the project. We recorded every site using photography, GPS logging, and context sheets which covered details such as topography, visible architecture and the presence of burials. It was incredibly demanding work, requiring a level of physical endurance that I will admit to being unaccustomed to! Some of the sites – Palaiopolis on Andros and Karthaia on Kea, for example – required long, steep hikes in the sun and heat to access, but the results were always worth it. Ultimately, I found seven of the forty-six sites to be very intriguing, and explored them further in my final report for Dr Sweetman. My conclusions were based upon the topography and architecture of these seven key sites, which all pointed to Christianisation as an incremental process, wherein different levels of society were building churches for different reasons, while coexisting with pre-existing polytheistic cult for multiple centuries. Overall, I had a fantastic summer of travel, research and learning. The School of Classics, the BSA and the Laidlaw programme were all hugely supportive of my project and I feel have gained a huge amount of experience from this internship. If anyone is interested in the Laidlaw internship programme, I would highly recommend it for two main reasons. Firstly, it allows undergraduate students to choose any research topic they desire, as long as they can demonstrate the viability and the impact – both academic and personal – of their proposed project. Secondly, its funding is remarkably generous. For up to ten weeks, the programme will award its interns £400 per week. I can say with confidence that this amount was more than enough to allow me to travel to and stay in Greece for five weeks, covering accommodation, food, travel around the country and personal insurance. I would never have had such a great opportunity otherwise, so I would strongly encourage anyone interested to consider applying to the Laidlaw programme in their third year.